Standing near the cross were Jesus' mother, and his mother's sister, Mary (the wife of Clopas), and Mary Magdalene. When Jesus saw his mother standing there beside the disciple he loved, he said to her, "Dear woman, here is your son." And he said to this disciple, "Here is your mother." And from then on this disciple took her into his home. 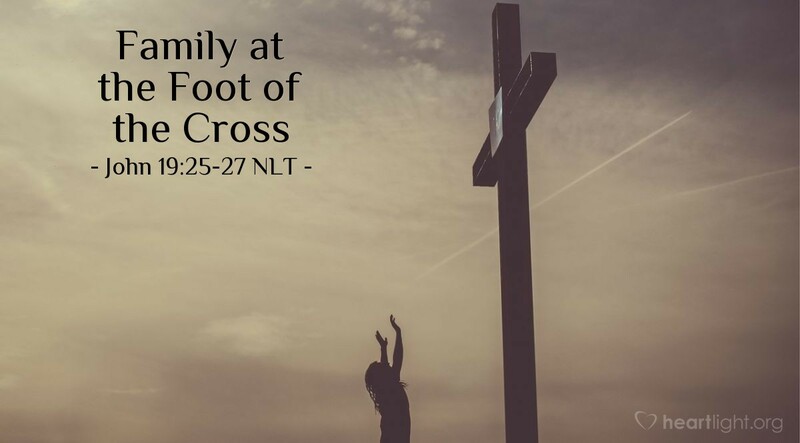 We find our spiritual family at the foot of the cross. Jesus' death brings us all together, destroying any and every barrier that would keep us from coming home and being family with each other. Holy and righteous Father, bind us together as your church into your family. Together, as we look at the cross and what it should mean to us, we commit to living as that family. Unify us as we all draw more closely to your Son Jesus, in whose name I pray. Amen.